PKSF on 05 June 2018, arranged a seminar over a baseline study titled ‘Sustainable Livelihood and Inclusive Development of the Bedey Community in Savar Upazila‘ chaired by Dr. Qazi Kholiquzzaman Ahmad, Chairman, PKSF. A presentation was made on the study by Dr. Tapash Kumar Biswas, Director (Research), PKSF. On the occasion, a total of 37 personnel from different Partner Organizations (POs) of PKSF and other related institutions attended the seminar along with 26 of the PKSF’s senior officials. At the beginning of the Seminar, Dr. Md. Jashim Uddin, Deputy Managing Director (Admin), PKSF made a brief on the background of the study. Dr. Jashim said that the Bedeys are mostly concentrated in Savar, Dhaka region and are a special group of population stricken with severe poverty. PKSF conducted a comprehensive study through its Research Division to assess the Bedey people’s occupational pattern, status of education, socio-cultural status and vulnerabilities with a view to finding the way out of poverty for them. Mr. Md. Fazlul Kader, Deputy Managing Director (Program) put emphasis on capturing the anthropological perspective of the Bedey community. Other participants also provided valuable opinions and made propositions. Mr. Md. Abdul Karim, Managing Director, PKSF acknowledged the study highly and conveyed his thanks towards the Director (Research) and the Research Division of PKSF for conducting such study. Hon’ble Chairman of the PKSF Dr. Ahmad remarked that it is necessary to know about the Bedeys since they are left behind and are left off from the mainstream development activities. Dr. Ahmad opined that the findings of the study would be applicable for other Bedey concentrated areas of Bangladesh. 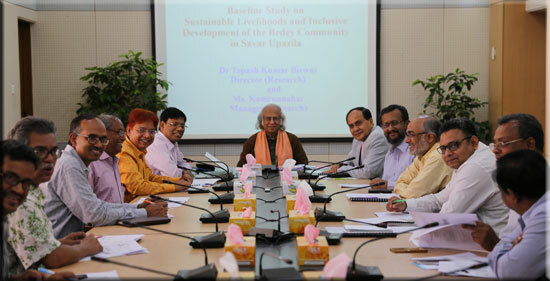 He hoped that this study would be useful for initiating development activities for mainstreaming the Bedey communities. He also appreciated the study to be very timely and stated that it can be published.